There’s 800 metres of lovely sandy, palm-lined private beach to begin the fun at the resort. It’s the perfect spot for trying out all kinds of water sports, from gentle sailing boats to high-speed water-skiing. Find plenty more fun in the three heated pools, with the kids well-catered for with one dedicated to them, along with a daily Children’s Club to keep them amused. Parents will appreciate the baby sitting service which is available during the day and in the evenings too. There is a veritable feast of dining and drinking options, around 15 at the last count, from casual poolside buffet breakfasts to themed evenings, floating bars to beachside snacks. Thinking business, the hotel offers everything here to host and run a truly professional meeting for up to 700 people indoors and receptions for 2500 guests outdoors. Flexible meeting rooms are equipped and serviced with the resources required for successful get-togethers. Team building opportunities can also be found all around this great location. If you do need to travel into the city, a complimentary shuttle bus makes the journey regularly. The Spa, in a great location overlooking the beach, offers 40 innovative face and body treatments for men and women. A traditional Hammam scrub room, jacuzzi, invigorating showers, steam room, sauna and a relaxing lounge will be heaven for over-stressed bodies. 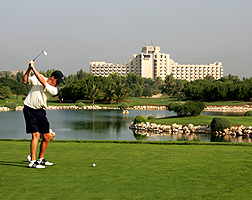 Golfers have a 9-hole course to play, plus floodlit driving range, plus pitch and putt greens. A horse-riding stable, shooting club, tennis courts and a fully-equipped gym are amongst the other diversions. The accommodation consists of 260 standard rooms, superior rooms and suites. You’ll find spacious bathrooms with walk-in showers and large bathtubs, and air-conditioned rooms with all the features you’d expect, even down to your own bathrobe and slippers. The fifth floor rooms come with the use of an exclusive lounge and a number of other benefits. Families will definitely warm to the idea of a family package that means that kids stay free up to 18 years old, and under 11s eat free too. Children from three to sixteen can play free in the Cool Zone Club, with activities including dancing, art, games, mini-chef discoveries, a mini disco, and much more.